Yamaha Unified Communications will showcase its meeting space product portfolio at Integrated Systems Europe 2019. ClearOne has begun shipping COLLABORATE Live, a series of four video collaboration solutions designed to provide a complete video collaboration experience for any size room. Nureva has announced that its HDL300 audio conferencing system has been designated by Zoom Video Communications as a recommended audio solution for medium to large Zoom Rooms. Nureva has released an integration of its HDL300 audio conferencing system with the Intel Unite solution for content sharing and collaboration. Custom Audio Video recently revamped a Hawaii-based healthcare provider's executive boardroom with Symetrix Radius AEC DSPs to help simplify the company's communications. New feature utilizes virtual microphone concept to managing undesired sound sources. New Futuresource study finds strong growth potential for audio in meeting rooms. 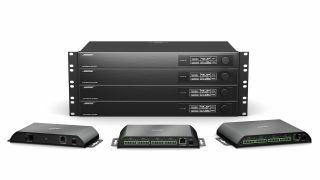 Shure to feature Microflex Complete integrated audio system at InfoComm 2018. Get your free copy of The Integration Guide to Microphones & Conference Systems.